Nebulizer is a kind of medical device which helps in converting the drug into mist and also delivers it directly to the lungs. Nebulization is commonly utilized for the treating respiratory diseases which includes cystic fibrosis, asthma and COPD. Several devices are used for the process of nebulization. Nebulizer treatment is offered when it is not possible to use an inhaler. Asthma inhalers differs from nebulizer which can also be labelled as an asthma device. In case of inhalers medicine has to be inhaled by the patient but nebulizers simply allows you to breathe and address medicines directly to the lungs. Inhalers are of two types, metered-dose inhalers (MDI) and dry powder inhalers. Global, development of efficient and advance technology and prevalence of respiratory diseases like asthma coupled with growing aged population are the prime growth drivers of global Nebulizers market and home healthcare devices as well. Portable nebulizers are being highly adopted which can be considered among the latest market trends due to the ease and convenience of its use. It is forecasted via acute analysis to experience a robust growth in terms of market size and worth. 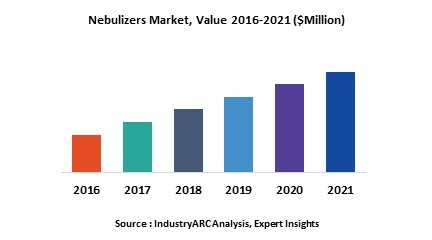 Emerging economies such as China, India and others, are going to create new opportunities and demand for global Nebulizers market and definitely add to its value. Surge in demand for home healthcare devices and rising geriatric population are among the key factors to enhance the growth in industry and revenue in Nebulizer market globally. However, higher cost of the research and development, dispersion and wastage of the drug during delivery to the respiratory tract and availability of nebulizer substitutes and higher cost prices of interventional devices are the key restraints for global Nebulizers market. Geographically North America dominated global Nebulizers market, with approximately half of the world’s procedures being done in the U.S. because of increasing prevalence of respiratory diseases coupled with increasing patient awareness level. Growth in home health care devices, high prevalence of respiratory disorders, aging population are forecasted to be the key factors aiding the growth in terms of size and revenue as well and have also contributed in the dominant share spectrum of these devices. Europe is projected to have the fastest growth, owing to increasing geriatric population base and is expected to follow North American market. APAC market is anticipated to be the most profitable market owing to greater available opportunity. This report recognizes the global Nebulizers market size in for the year 2014-2016, and forecast of the same for the year 2021. It also highlights recent industry trends, developments, dynamics, market drivers, market trends, restraints, growth indicators, challenges, market outlook, future outlook and other key aspects with respect to global Nebulizers market. Nebulizers Market, By Product Type (Ultrasonic nebulizer, Portable, Stand Alone, Pneumatic, Breath-Actuated, Vented, Mesh, Vibrating mesh, Static Mesh). Standalone and Portable are sub segments of Pneumatic nebulizer and Ultrasonic nebulizer. Mesh nebulizer segment is expected to experience the highest surge over the forecast tenure owing to the efficacy and effectiveness of these devices. This report has been further segmented into key regions, which comprehends comprehensive analysis of each region such as: North America, Europe, Asia-Pacific (APAC), and Rest of the World (RoW) covering all the major country level markets in each of the region. 13.10. GF Health Products, Inc.